HMAS Choules has embarked on a month-long deployment for maritime and land warfare and security training to support capability building for Australia’s regional allies as part of the Prime Minister’s Pacific step-up. 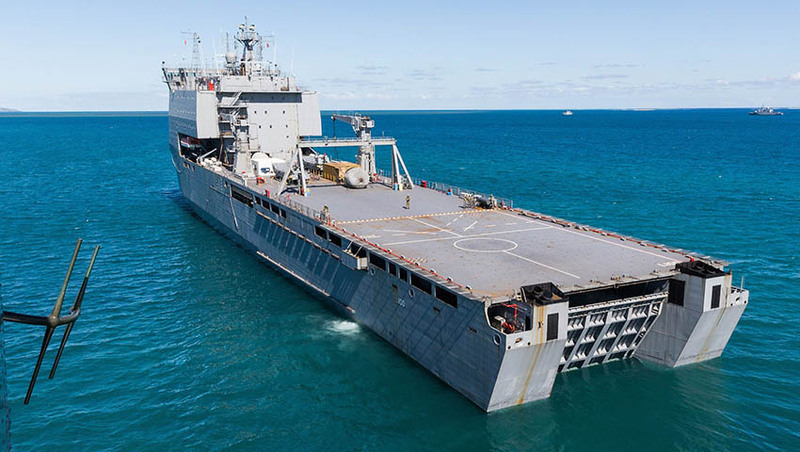 HMAS Choules, an amphibious landing ship, departed Townsville on 19 February bound for Papua New Guinea, Solomon Islands and Vanuatu, where Australian Defence Force (ADF) personnel will undertake an extensive program of bilateral training with regional militaries and other government agencies. Minister for Defence Christopher Pyne said the activity was an early contribution to the Australian government’s Pacific step-up announced by the Prime Minister last November. The deployment marks the beginning of several joint activities with regional partners in the Pacific scheduled this year. The Pacific step-up strategy incorporates a number of different focuses, ranging from economic and infrastructure development, combined with a renewed Australian strategic and defence commitment to the broader Pacific region, which were outlined by Prime Minister Scott Morrison as part of the 2018 APEC leadership conference in Port Moresby. “This activity will enhance Australia’s engagement in the region, strengthen our regional relationships and assist in the building of regional partner capacity. Australia and the Southwest Pacific have partnerships built on historical and community links as well as shared trade, investment and security interests,” Minister Pyne added. Building on these factors, Defence will play a critical role in implementing the Pacific step-up program, providing training, support and officer development, providing people-to-people connections and the introduction of specialised, large-hulled, multipurpose amphibious ship to support increased engagement in the Pacific region. HMAS Choules, her Ship’s Company and other ADF personnel will return to Townsville in March.